Based on its valuable natural assets, this hiking trail requires several car rides between the selected attractions. The total duration of the tour is ca. 8-10 hours. It is possible to split the route into two stages: a northern and a southern one (in relation to the river Warta). As you walk, see Section 1.6 (see p. 74), where we describe the natural value of the protected areas and the subject matter of educational trails on your way. The route begins in front of the forester’s house in Nowiny. Access is possible via a gravel road, leaving north from road 132 between Witnica and Bogdaniec, ca. 100 m east of Motylewo. At the stat of a gravel road, there is a clearly visible sign with a red background, informing about the border of a Natura 2000 site. Near the forester’s house (about 500 meters away from road 132) there is a small car park. From there, the reserve is only a few hundred meters away. Leave your car in the parking area and walk straight ahead down the gravel road. After a few dozen steps, take the first turn to the right. The road climbs upward and then splits. You should follow the main road with a slight curve to the left, until you reach the information board about the reserve Bogdanieckie Grądy (formerly Bogdaniec II). Behind the sign, you will see a road running along the ridge of the hill. Taking this road will let you explore highly picturesque ravines and steep slopes covered with a magnificent oak wood. The walk will take 1–2 hours. Return the same way. The next stop on your way will be a visit in the nature reserve Las Morenowy (formerly Bogdaniec I). It is just nearby, therefore you will not need to move your car yet. Take the main gravel road in the direction of the asphalt road 132. Just before the crossroads you will see a road to your right. It has signs of a horse riding trail painted on some of the trees along it. After ca. 500 m meters down this road, you will reach the edge of the upland again to see a magnificent view of the old beech and oak forest. You can continue along the same trail until you reach the limits of the nature reserve. The walk will take you about 1–1.5 hours. The next stop is the nature trail Olszynki. Take the 132 road to Kamień Mały and turn left behind a fueling station into the paved road. Then pass the railroad crossing and take the straight, bumpy but passable road, to slowly reach the car park with a lookout tower 2 km away. From there, keep walking back through ca. 900 m in the direction of Kamień Mały, to a wooden bridge on a roadside canal. Here starts a footbridge of the path that leads into the forest swamp. Three overpasses, with the total length of ca. 1.5 km, and the so-called “Cottage on the water” will allow you to observe the marsh habitat of great beauty that one cannot reach in other circumstances without getting absolutely wet. The path is a loop with a length of 3 km, so you will reach the car park again by returning another way. Along the way, you will see educational boards placed there to help discover the specifics of the surrounding habitats and natural phenomena. The walk will take 1.5–2 hours. The next stop is the Birds’ Trail (Ptasi Szlak). From Kamień Mały, go through Kostrzyn or use the Warta ferry ear Witnica to get to Słońsk. There, on the roundabout in the center of the village, there are signs poining to the birdwatching trail. They will guide you through Przyborów to a road made of concrete slabs (hence its popular name: Betonka) and further, to a large hexagonal rain shelter and a parking area. 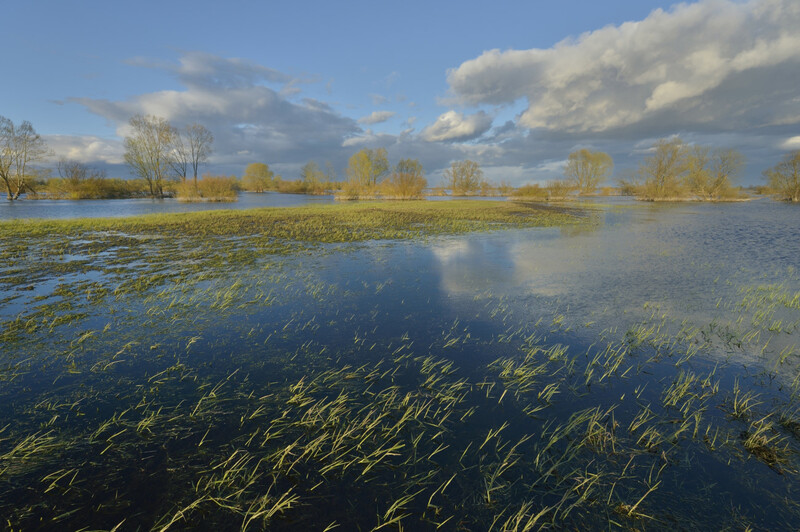 From there, you can go on the 2.5-kilometer walk, passing through the most precious habitats of the Warta Mouth National Park: its floodplain meadows with low grassy vegetation. On the trail, there are information boards and a viewing platform. At the end, there is an ornithological lookout. Return the same way. The walk there and back will take ca. 2 hours. Near Słońsk, there is the last stop on your way: the reserve Postomia Valley and the reserve Lemierzyce. To reach them, you will need to drive from Słońsk in the direction of Głuchowo: from the church via the bridge on Łęcza at ul. Poniatowskiego, and continuing straight onto the main road. When you get to a sharp turn to the left and the bridge on Postomia, take the exit to the dirt road right before the bridge visible on the right side. Park your car there and walk on. After about 200 meters the road reaches the feet of picturesque steep slopes covered with stately oaks, beeches, hornbeams and pines. The length of the entire route is 5 km one way. It ends in Lemierzyce. This tour coincides with the Woodpecker Trail, a theme trail prepared by local enthusiasts of history and nature. Return the same way or along the prominent floodbank on the opposite bank of Postomia (which we recommend). You can get there after crossing the bridge in Lemierzyce. The total walking time is about 3-4 hours. When visiting the vicinity of Słońsk, it is definitely worth exploring the historical riches of this town. A real gem is the church from 1522. It was established by the Protestant Order of Saint John. Słońsk was the seat of its bailiff, a high-ranking representative of the religious hierarchy. Hence, next to the church you can find the ruins of his extensive palace. In the churchyard, there is a half-timbered building, where an exhibition of regional artifacts is kept. Then, we recommend you see an over-century-old pumping station and a historical mill that deserves to be called a “living museum”, two lapidaria and the Museum of Martyrdom. The spatial layout of the village is noteworthy as well.